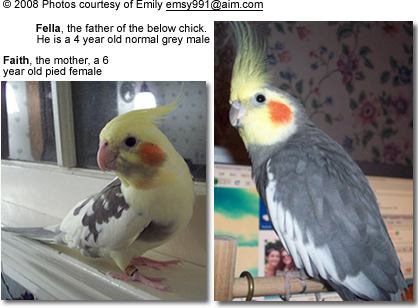 Emily - the proud owner of the beautiful cockatiel parents Faith and Fella (on the right) - sent in the photos of her beautiful cockatiel chick "Freckles." Freckles appears to be either a pearly or pied pearly mutation. Freckles' day-to-day growth and development is reflected in the photo series featured below. To simplify uploading, all photos have been integrated into one image - therefore, it may take a moment to load. Your patience is appreciated - you will find the photos worthwhile waiting for. If Freckles is a girl, she will keep the beautiful pearly coloration into adulthood. If it turns out to be a male, the pearly coloration will molt out (most likely to a pied) coloration as this chick reaches maturity. Jennifer Christensen, who has an in-depth understanding of cockatiel genetics, offered the following insight: "I wanted to point out that Freckles is a female. It is obvious just by the colors of the parents. The only explanation is that the dad is split to pearl and when that is the case only daughters inherit the gene visually. For it to be a male pearl both parents would have had to contribute 1 pearl gene. The mom is not a pearl and females cannot carry the pearl gene as a non visual split."